Set to be an epic finale for the Davy Jones story, will At World’s End be a success for Disney? 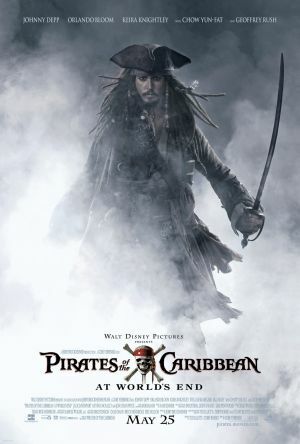 Continuing where Dead Man’s Chest left off, this adventure sees Jack Sparrow, Will Turner and Elizabeth Swann raising a pirate army, risking riding off the edge of the world and fighting the monstrous pirate Davy Jones for Sparrow’s life. The opening, which shows a mass hanging of pirates by British Troops, clearly identifies the British as a strong and villainous enemy whereas previously British troops have provided little more than gags or pathetic attacks on pirates; this present and dangerous enemy is a clever way to heighten the films epic status. During the opening scene a pirate song is sung to defy the British which nicely transitions to Elizabeth Swann humming the same tune. This is a smart device to show her own transformation from British damsel to fierce pirate although with Keira Knightley in the role this is never entirely convincing. What’s more, she becomes not just a pirate captain but the King of all pirates representing the Chinese. It’s all very strange and this phenomenal rise in ranks is lightning quick which unfortunately seems to be there to disguise Swann’s lack of actual character. In contrast Davy Jones once again impresses as the best character of the franchise. With Bill Nighy’s expertise, he not only scares and intimidates like in Dead Man’s Chest but here his back story is finally unwound with his display of fury, vengeance, remorse and regret making him a stronger and well rounded character. Watching Davy Jones play huge organs while releasing a single tear is also a nice inclusion and is in keeping with his grand, legendary persona. Once again the Pirates franchise creates exaggerated action sequences in particular the introductory segments for every character we’ve met in the last two films. An abundance of fights, however irrelevant to the main plot, and an impromptu wedding both result in a confusing and tiresome experience. Being a swashbuckling Disney adventure and aimed largely at kids this drawback could perhaps be forgotten but with an incessant ramp up of action this could prove a turn off for more mature age groups. At World’s End provides a strong conclusion to the Davy Jones story managing to maintain the excitement of the debut while building on the solid characters from the franchise.